“What do you mean, he’s asked how much I am?” asked a stunned Eden Collinsworth upon learning that a Chinese businessman had inquired if she were available for purchase. Despite this precarious introduction to China, no country has fascinated Collinsworth more during a career that has moved her around the world. Convinced that—despite the nation’s status as a world leader—the Chinese are still socially uncomfortable with their Western counterparts, she collaborated with a major Chinese publisher to produce a bestselling Western etiquette guide. 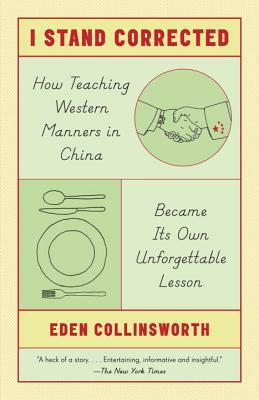 Now, in these pages, Collinsworth tells the unforgettable story of the year she spent living among the Chinese while writing a book featuring advice on such topics as the rules of the handshake, making sense of foreigners, and behavior that is considered universally rude. Informative, hilarious, and thought-provoking, I Stand Corrected is at once an entertaining memoir and essential reading for those looking to understand the mores of the rapidly changing—and increasingly important—nation that is China. Eden Collinsworth is a former media executive and business consultant. She launched the Los Angeles-based monthly lifestyle magazine, Buzz, after which she became VP & director of cross media business development at Hearst Corporation. She has been the chief-of-staff of a global think tank and, in 2011, launched Collinsworth & Associates, a Beijing-based consulting company that specializes in intercultural communication. Her Chinese language book The Tao of Improving Your Likeability: A Personal Guide to Effective Business Etiquette in Today’s Global World has become a major best seller in mainland China.